Ittle Dew is 2D logical action game from Ludosity studio, created in Unity 3D. 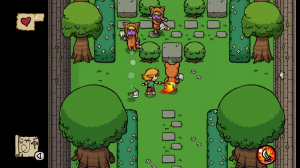 Developers were inspirited in game Zelda. Heroine (!) of this game reaches island full of puzzles and treasures and she must solve them with help of mystical tools. She gets them from, that will build her raft after she brings artifact from castle. Gamer has friend Tippsie every time with him and he gives guidance to gamer. All game consists of finding treasures full of gold inside the castle. For them you can buy tools (not necessarily in exact order) for solving puzzles. They are: fire sword, ice staff and teleport staff. Your first tool is stick that you can put on fire for short time. 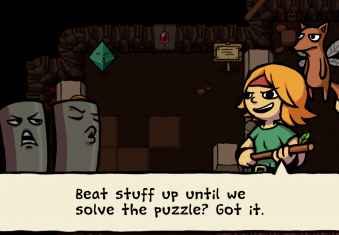 Puzzles are almost everywhere in the game and after each section (finding gold, buy tool) is gamer coming to location, where he firstly need to find tool and with its help he can get from location, and he can solve other puzzles. After each section there is section with boss, that is based on finding mechanism how to defend from boss attacks and how to use them against himself. Puzzles are pretty simple, no one should have problems with them. It’s pity that they are so much easy. Puzzles are using mechanism of cubes – you can move them, destroy fire bombs, freeze them and teleport them. It’s a little bit strange that you can freeze firing bomb and then it keeps firing after thawing. If you don’t know what to do, Tippsie will help you everytime. His advices in locations are showing very generally. The game in boss fights don’t let you even think and it gives you opportunity to instantly know solution from Tippsie. Game is filled with funny messages, graphics are retro, but nice and animations are nice and smooth. Big plus is a soundtrack, which is simple but very encouraging when you want to think. My favorite tracks are I’m Thinking and Itan’s Cabin. You can listen to the soundtrack right here. I must note something about gameplay. Reaction of buttons is little bit hard and sometimes press is not even recognized. So fights are little bit unbearable. I recommend this game to all who like logical games. But it will be rather short with its 4 hours of gameplay. And what do you think about this game? Is it good? Are puzzles hard or easy? And what about gameplay and controls? Write it in the comment section bellow! Share and visit our page on social networks. It will help very much! We are the three-member indie development team from Brno (Czech Republic). Our goal is to develop meaningful and fun games. We’re enjoying our work on our game. It fills us, so we give it all our free time as we possibly can. Game AidTech is a reaction to the poor quality, easy and pointless games, which occurred recently. We are gamers too, so we know, what other gamers expect from games. We do it especially for you, and gamer’s community.